This blog was supposed to be a tribute to the good old nuts. Nutty nuts...like walnut, pecan, peanuts and coconuts (oops!). Sorry for those who are allergic to them. However, I wasn't able to have the proper time to compile all the food that I had prepared and have eaten with it, sure is not a way to give justice to these protein and mineral rich food. Not to waste the thought though, I wished to pay my testimonial for a high school mate who I haven't seen nor talked to for years like any of my close friends, and Facebook made it easier for all of us to touch base with. :Before we get to her baked goods, let us first meet her. Here she is, Armi Rose as we know her, is a mom to two adorable kids, hhmmm, I don't think that her eldest boy would still be considered a kid anymore. You will see more of her in the coming days, she had come out of her baking shell and is welcoming the sweet world with her delicate concoctions. This hot and fabulous lady knows how to make each occasion extremely worthwhile and once you try out her baked goods your life will turn upside down and sweeter. The one on the top is the Nutty Cappuccino cake. I ordered this for our teachers' training. It instantly became a crowd-pleaser. A coffee and a cake in one, let me say, topped with a delightful dollup of pure chocolate fudge. Silkened with a cream-based icing with a subtle aroma of cappuccino. Finished off with nuts sprinkled all over the top and of course, the cherries. Here a shot I stolen from my seatmate's plate. Look how perfectly airy but firm the cake is, and in between two layers is a scathe of more chocolate goodness. The nuts added crunch and savory to it. My friends and church mates who were at the training enjoyed the cake and sadly I didn't get a big slice. The coffee aroma of the cake had everyone getting slice after slice, so I guess you know what that mean. Did I mention I had two cakes that day? The Nutty Toffee Crumble Cake was a surprise. I wouldn't mind having too much nuts for that day and oh well of the cakes too. What wonder can brown sugar make. If you're not that fond of that kind of sugar, you will definitely change your perspective of it. This reminded me of my childhood cravings for toffee. A toffee is actually a candy, a mixture of sugar and butter, something that resembles a caramel or butterscotch. Having said that, I'm sure it made you drivel, by the sound alone of sugary sweetness of the cake. Sinful indeed, this cake is. 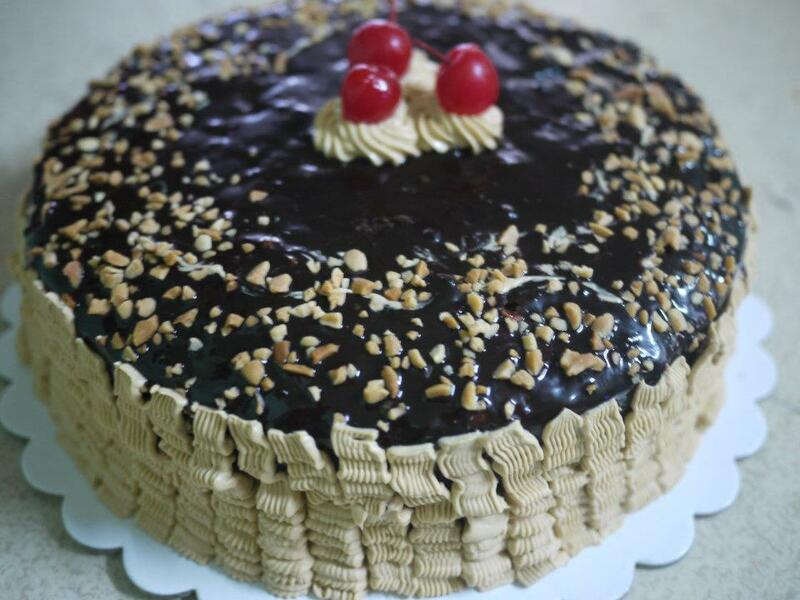 The toffee cake is smothered with dulce de leche, drizzled then with chocolate ganache and wonderfully topped with peanuts. The dulce de leche was spot on and I love how it matched the toffee cake. I couldn't tell you how fast slices of these cake were gone in an instant at our home and as I was writing these, I am drooling, and sorry if I made you salivate also. 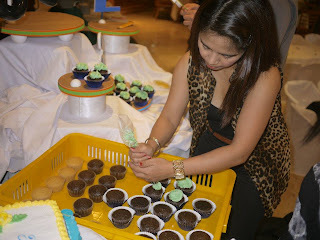 Okay now, I'm sure you want to meet the lady behind these cake creations and delve into these cakes. She's your friend? She's my cousin! Haha. I asked her to bake a cake for Kelly's first birthday next month. Small world! @ Kimberly...What a small world indeed! She was actually a batch mate from Saint Mary's, in HS. Super love her cakes, I haven't tried her cupcakes but It will be great I'm sure! Enjoy preparing for Kelly's birthday, it may be stressful but for sure it's going to be amazing and fun! the nutty toffee cake and Nutty Cappuccino cake made me drool!! !